What would these pages be without pictures? The travelogues would lack spice, and you'd never see my kilts in their glory! I purchased an Apple QuickTake 100 about a year after it was released, just in time for my 1995 trip to Eivissa and Gran Canaria. It used a serial cable to transfer photos to a host computer. Its pictures were 640 by 480 pixels. 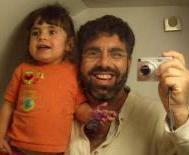 In the late 1990s I moved up to a second-generation digital camera, the Kodak DC-120. Its pictures were 756 by 504 pixels. For the first time I was able to untether the camera from the computer. I went out and purchased the largest Kingston PCMCIA flash RAM card available, which allowed me to store around 120 images on the card. It was amazingly liberating to walk around Burning Man for an entire day and only in the evenings pull my PowerBook from its dusty bag to hold my daily catch of pictures. The Nikon CoolPix 950, with a 2.1 MB CCD, gives me a 1600 by 1200 pixel (UXGA) picture. Bigger, and much clearer. The camera died, however, after only a short time. 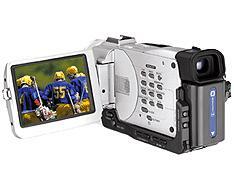 So came the Sony DCR-TRV20 digital video recorder, which happened to have a still digital camera within. Its images, 1152 by 864 pixels, aren't nearly as good as the Nikon, but the damn thing is working. I took it to Burning Man 2000. 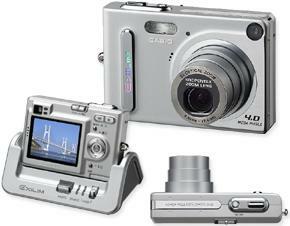 In late 2003 I acquired a Casio Exilim EX-Z4U, a 4 megapixel credit-card-sized camera; pictures are 2304 by 1728 pixels. The photos printed at our local photofinisher surpass 35mm film cameras. Very shortly thereafter, due to a sandstorm, I acquire a Casio Exilim EX-Z4 (the non-US version, with the ability to take video clips as well). 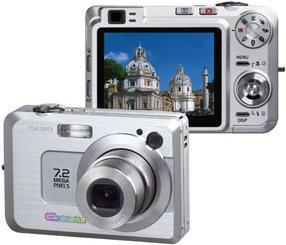 In the summer of 2005 I acquire a Casio Exilim EX-Z750, a 7.2 megapixel camera only a bit larger than the EX-Z4; pictures are 3072 by 2304 pixels. The most remarkable thing about this camera is the huge 2.5-inch LCD, which takes up most of the rear. 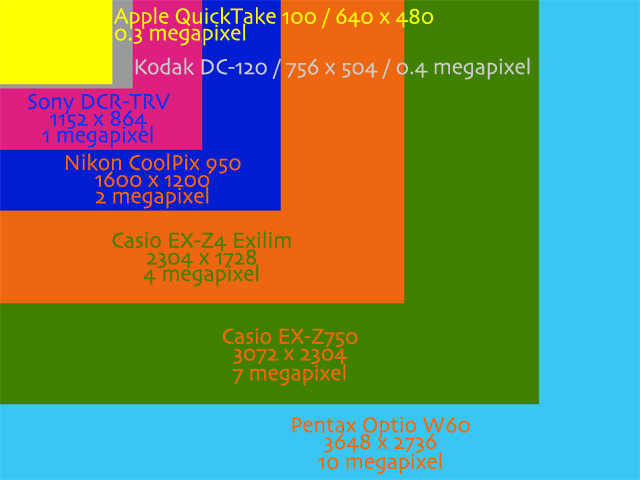 WARNING: Do not buy any Casio Exilim cameras! While their fit and finish are superb, and the pictures are excellent, they don't hold up to even the dust within pockets, making it useless for its intended purpose. Furthermore, I've heard terrible things about Casio support in dealing with this issue; I'm not encouraged about the reception my cameras will receive. An update will be posted. This saddens me a great deal, as I've grown to love these cameras. I have, instead, purchased a dustproof and waterproof Pentax Optio W10. After both of my Casio Exilim cameras sucumb to the dust in my pockets - not so good for a pocket camera - I purchase a dustproof and waterproof Pentax Optio W10 in the springtime of 2006. 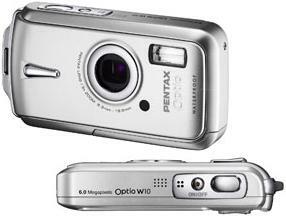 WARNING: The Pentax Optio cameras have a bug whereby the video picks up the sound of the zoom such that it makes that transition time worthless without cutting that out from the movie of replacing the sound with music during post-processing. Worse is the complete denial of this problem by Pentax technical support. Great durable camera; one serious flaw; mendacious support. Be aware. At the very end of 2006 I buy the Pentax Optio W20 (with a 2GB SD card) and hand the W10 to Rose to use full-time, instead of us handing the camera back and forth several times daily. At the very end of 2008 I buy the Pentax Optio W60 to replace the now-broken W20. Still pocket-sized, still water- and dust-proof, and now 10 MP images and 708p HD movies (along with a 16 GB HDSC card).